This is my adaptation of a buttermilk-waffle recipe by the French Laundry chef Thomas Keller. (If you've bought the All-Clad Belgian waffle maker, the recipe appears in the accompanying booklet.) 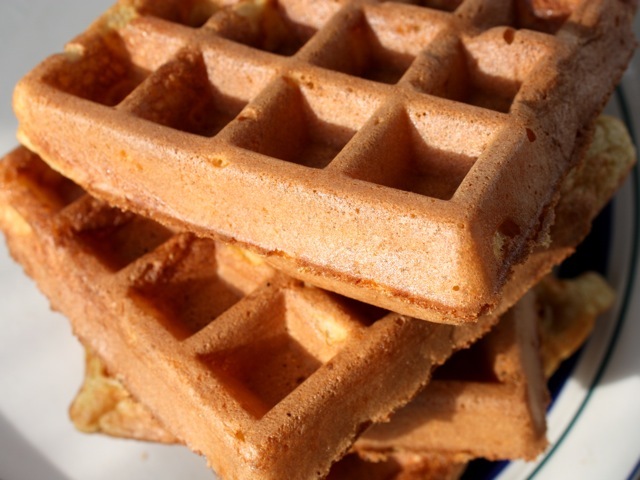 I've added a few ingredients and changed up the flour blend to give the waffles more intriguing flavor. If you make these in a Belgian waffle maker, you'll only get about 8 to 12 individual squares from one batch. An ordinary waffle iron will yield more waffles, but they'll be thinner and less puffy. In a large mixing bowl, whisk together the flours, baking powder, baking soda, salt, sugar, and spices. In a separate bowl, mix together the vanilla extract, eggs, buttermilk, and melted butter. When the iron is hot, add the dry ingredients to the wet ingredients and lightly whisk the batter together. Use a measuring cup (½ cup is a handy size) to scoop, pour, and spread the batter around the iron. Cook until golden-brown and crispy, about 5 minutes or so depending on the iron. Repeat until all the batter is gone. Serve immediately, or put the finished waffles in the warm oven to keep warm and crispy until you're ready to serve them. If you don't have buttermilk, mix plain yogurt, sour cream, or crème fraîche with milk until you've reached the consistency of buttermilk (about 1 cup of the thicker dairy to about ⅓ to ½ cup of the milk). You could also replace the buttermilk with kefir. If you have extra egg whites on hand, whip them into soft peaks, then fold them into the batter for fluffier, crispier waffles. (Be warned, however: you'll need to grease the waffle iron more, and more often, to counteract the stickiness of the egg whites.) You can also simply separate the eggs called for in the recipe and whip those whites. If you like, peel and grate an apple, or dice a ripe pear, or mash up about a cup of roasted pumpkin, to add to the batter. A large handful of toasted walnuts, hazelnuts, or pecans, minced or quickly pulverized in a food processor, adds a bit of crunch and oomph. Crème fraîche and huckleberry syrup make a delicious tangy-sweet topping combo for these waffles. Adding fresh or defrosted whole blueberries to the dry ingredients, then slathering the fresh waffles with lemon curd, is also delicious.